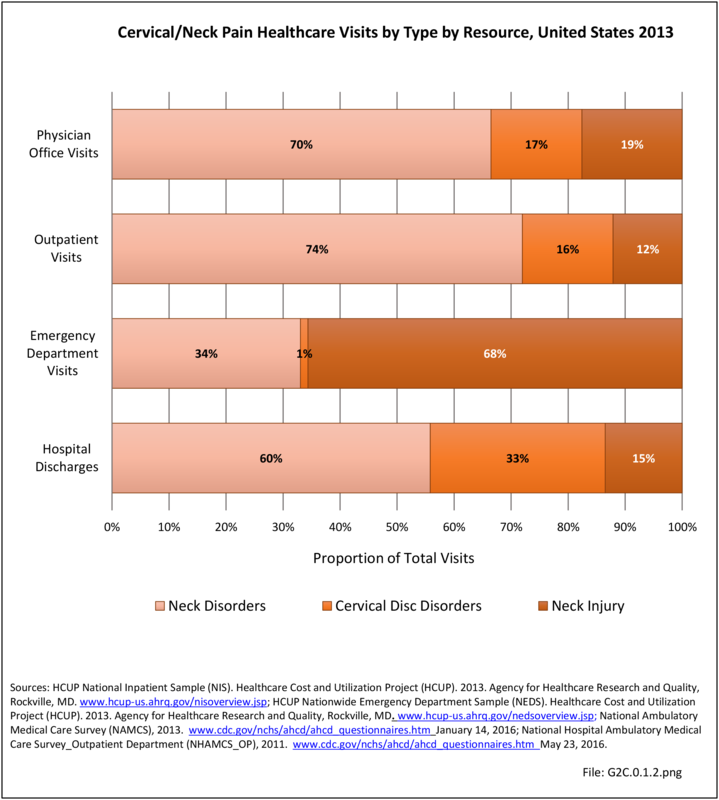 Lumbar/low back pain and cervical/neck pain are among the most common medical conditions requiring medical care and affecting an individual’s ability to work and manage the daily activities of life. 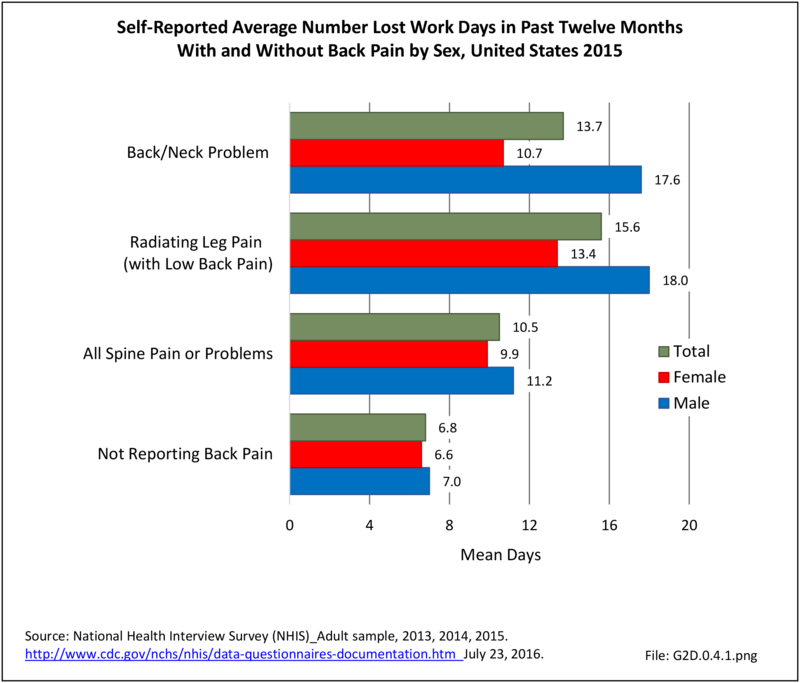 Back pain is the most common physical condition for which patients visit their doctor. 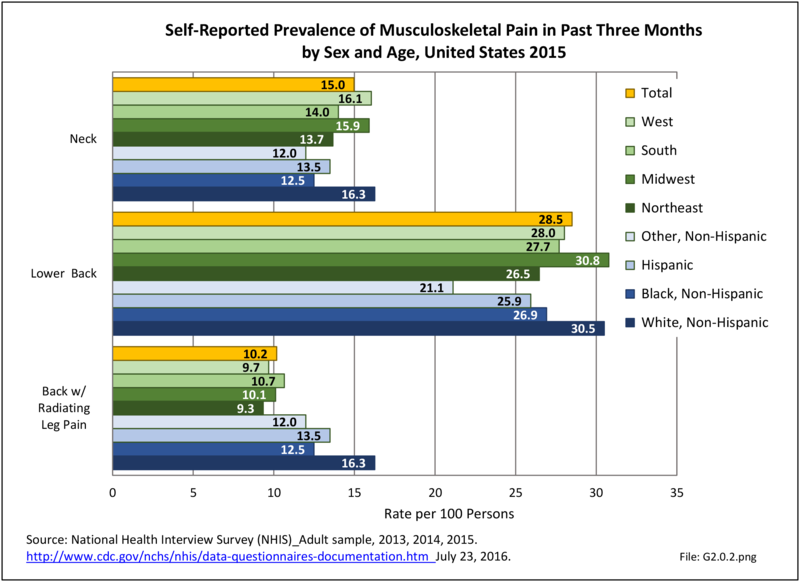 In any given year, between 12% and 14% of the United States adult population age 18 and okder visit their physician with complaints of back pain. 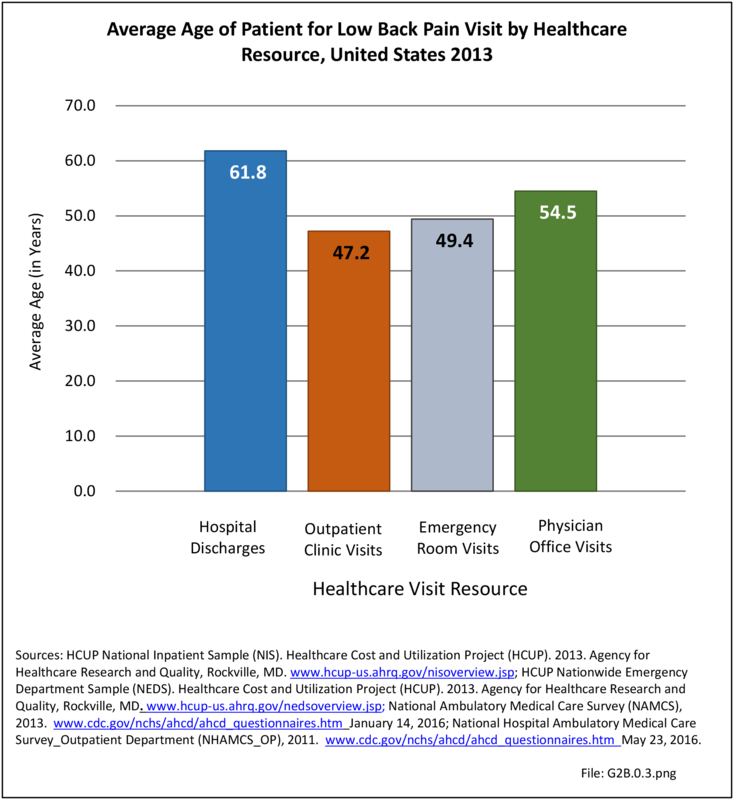 The number of physician visits has increased steadily over the years. 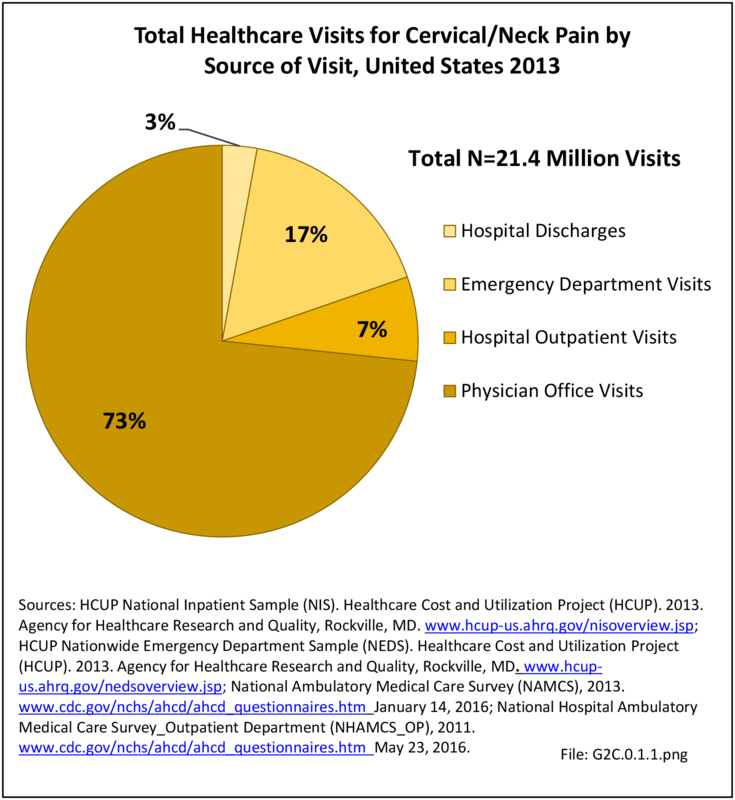 In 2013, more than 57.1 million patients visited a physician with a complaint of back pain, compared to 50.6 million in 2010. 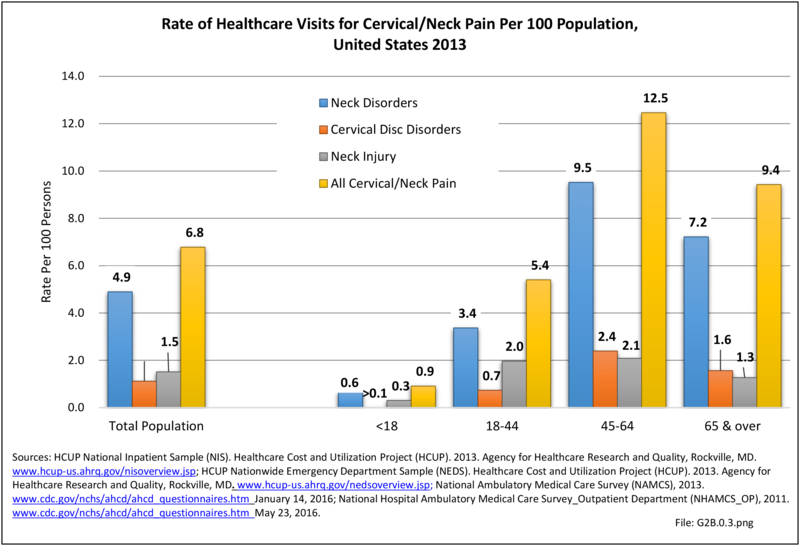 (Reference Table 2A.5 PDF  CSV ) In addition, an unknown number of patients visit a chiropractor or physical therapist for these complaints. 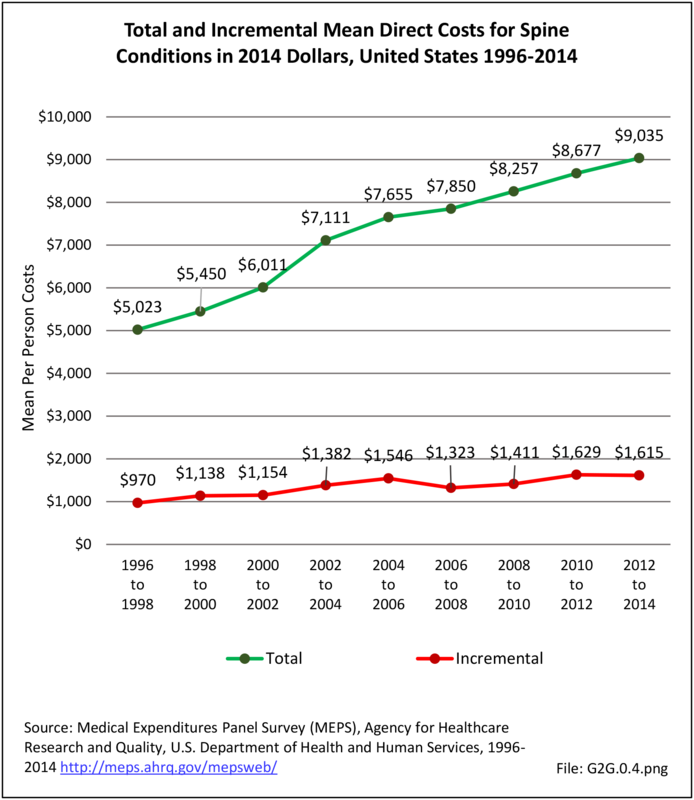 The estimated annual direct medical cost for all persons with a back-related condition in 2014 dollars was an average of $315 billion per year across the years 2012-2014. (Reference Table 8.6.2 PDF  CSV ) This is further discussed under the Economic Burden topic in this Spine section, and in the Economic Cost topic at this site. 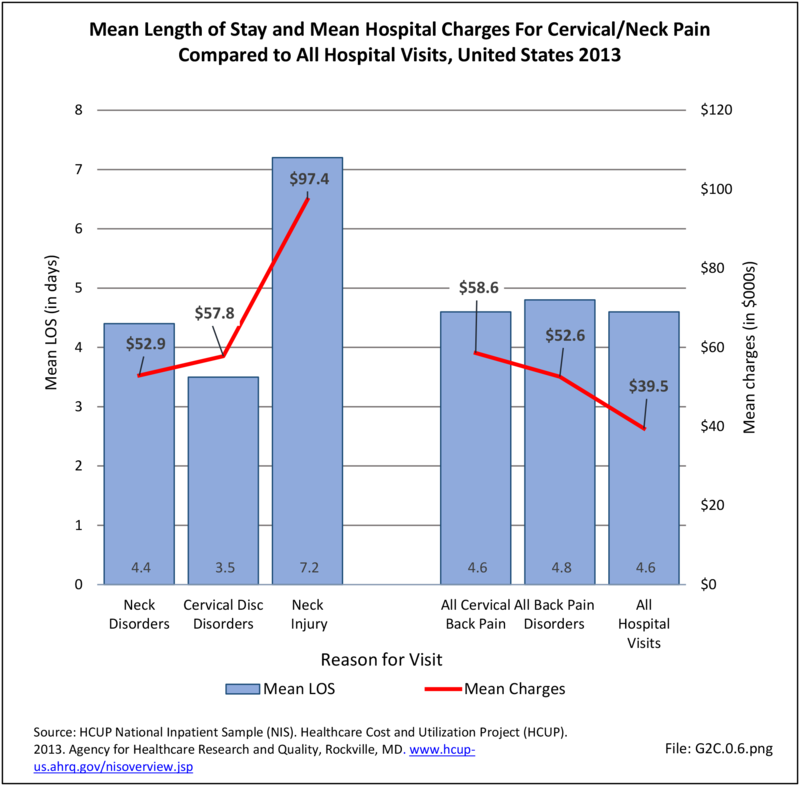 As noted previously and elsewhere, this is not the true cost because chiropractic care, physical therapy, alternative therapy, and other care is not included in the analysis. 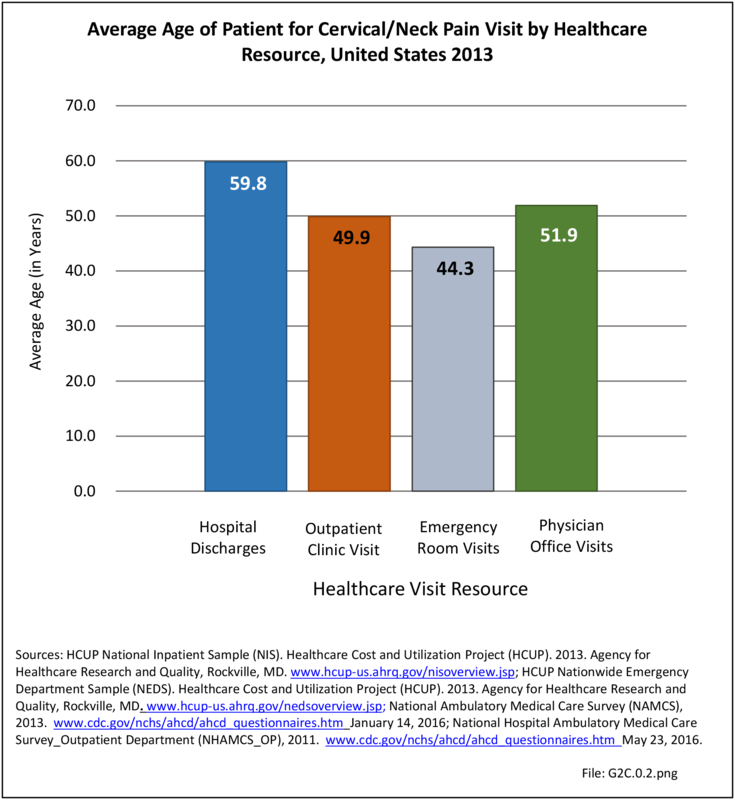 Also, treatment cost from outpatient clinics is currently not available; hence, these data are missing or incomplete. Back pain often originates from sources that are not readily identifiable. 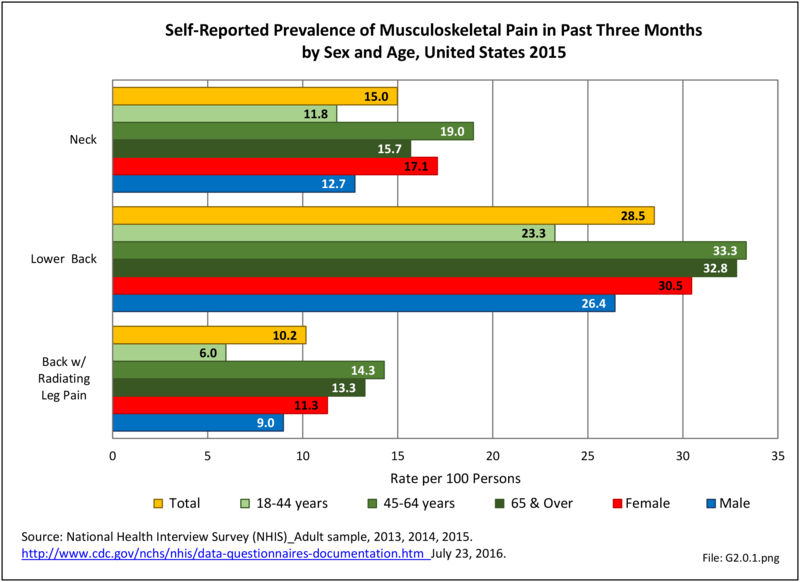 Many causes of back pain are likely related to degenerative changes, but the actual underlying cause of a given back pain episode is often uncertain. 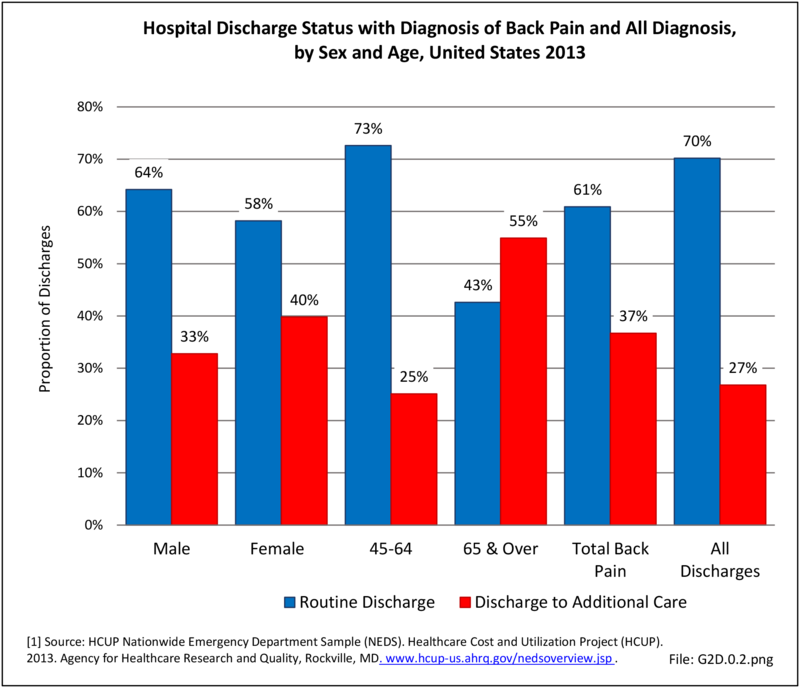 In reviewing administrative data for prevalence, it is important to realize that the diagnostic categories may be inaccurate because they reflect differing interpretations about the source of the back pain rather than an absolute diagnosis. This will be discussed further in later sections. 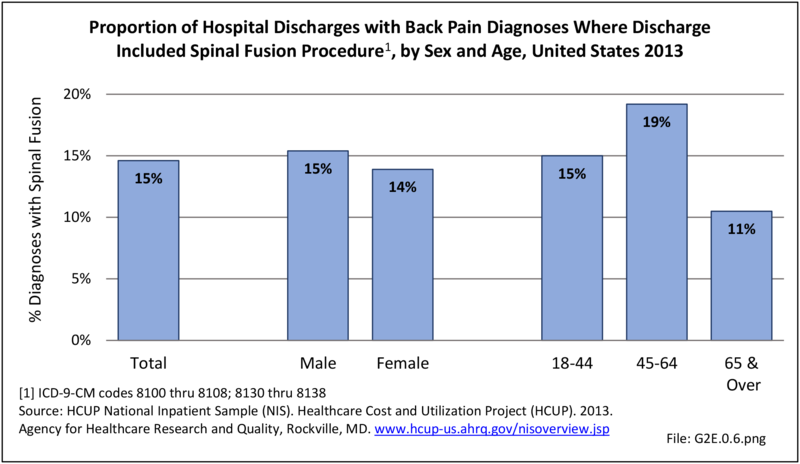 For purposes of further analysis, we decided to divide the diagnostic codes defining the burden of spine problems into three groups: back disorders, disc disorders, and back injuries. This approach allows comparison to earlier editions of the text. We are aware there may be substantial overlap, and that some of the back disorders may be related to degenerative disc changes and some of the disc disorders may have another origin. 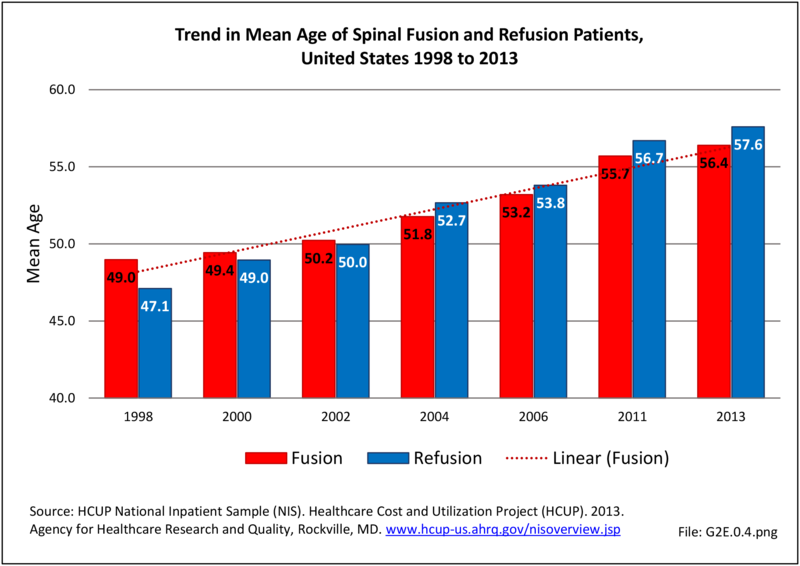 The role of disc degeneration in the cause of back pain remains uncertain. Intervertebral disc degeneration and associated facet joint osteoarthritis seem to be a natural process of aging but can alter the biomechanics and function of the spine. Studies have identified a strong genetic predisposition, but there are modifying influences including age, obesity, smoking, and genetics. In the tables and text, we define back disorders by diagnostic ICD-9-CM Codes 720, 721, and 724. These codes include inflammatory spine conditions, spondylosis, spinal stenosis, lumbago, sciatica, backache, and disorders of the sacrum. 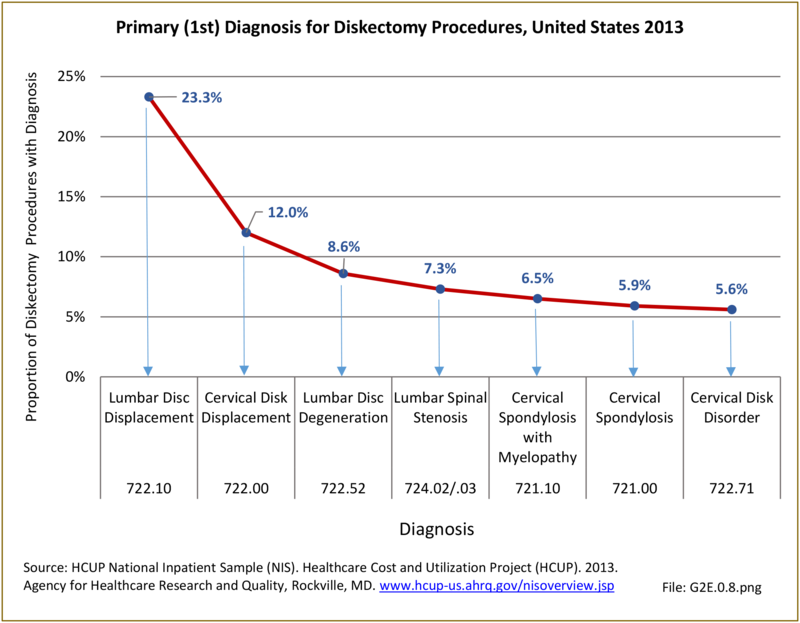 Disc disorders include herniations, disc degeneration, and post-laminectomy syndromes (ICD-9-CM Code 722). Back injuries include fractures, dislocations, and sprains (ICD-9-CM Codes 805, 806, 839, 846, and 847). 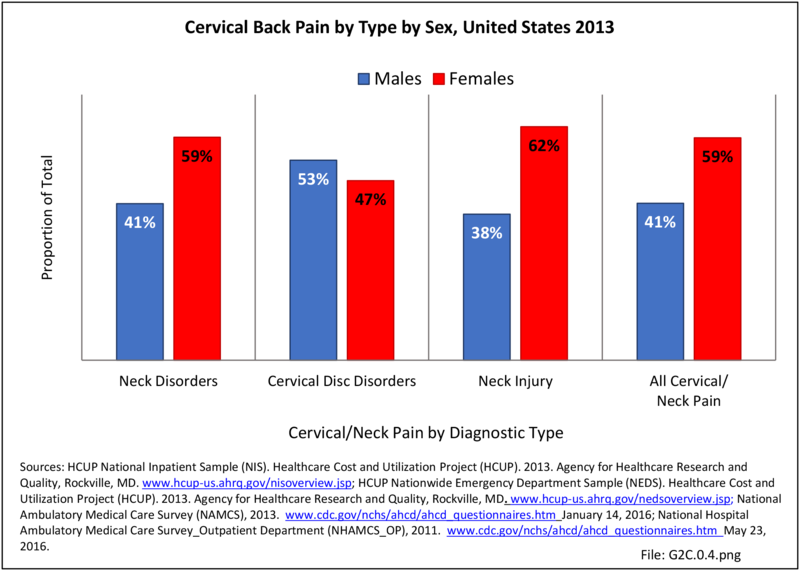 The same classifications are used for both low back pain and neck pain. Thoracic back pain, or upper and middle back pain associated with the 12 spinal bones connected to and in the same level in the body as the 12 ribs, is less common and not as well studied. 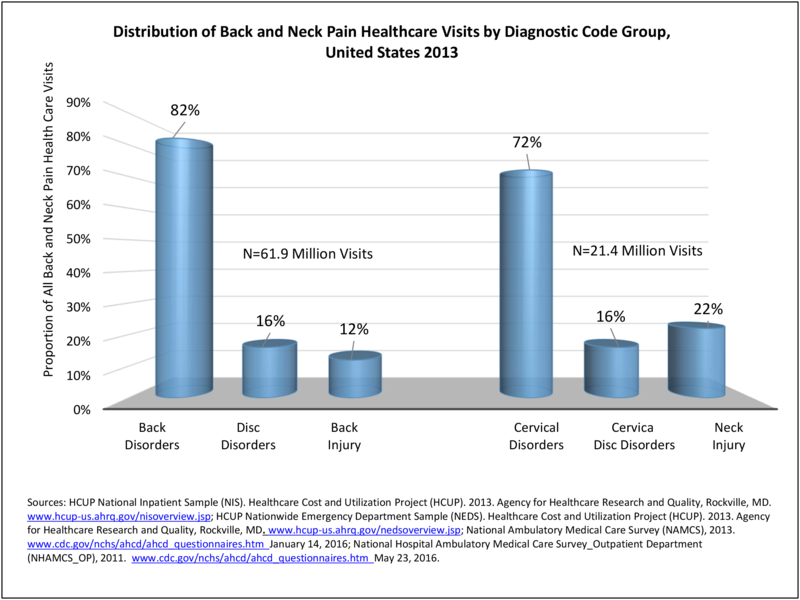 Data associated with thoracic spine pain is generally included in the analysis of low back back and disc disorders and injuries. Unfortunately, the databases do not permit diagnostic verification. Sometimes diagnoses are provided primarily for reimbursement purposes, with little emphasis on accuracy. Further, there is considerable overlap. For example, a patient with back pain of unknown origin could be given the diagnosis of lumbago, placing him or her in the back disorder category. He or she may also have disc degeneration with a diagnosis of degenerative disc disease and, therefore, be placed in the disc disorder category. Or, if his or her problem developed after a lift or twist, it could be diagnosed as a back strain, falling into the back injury category. 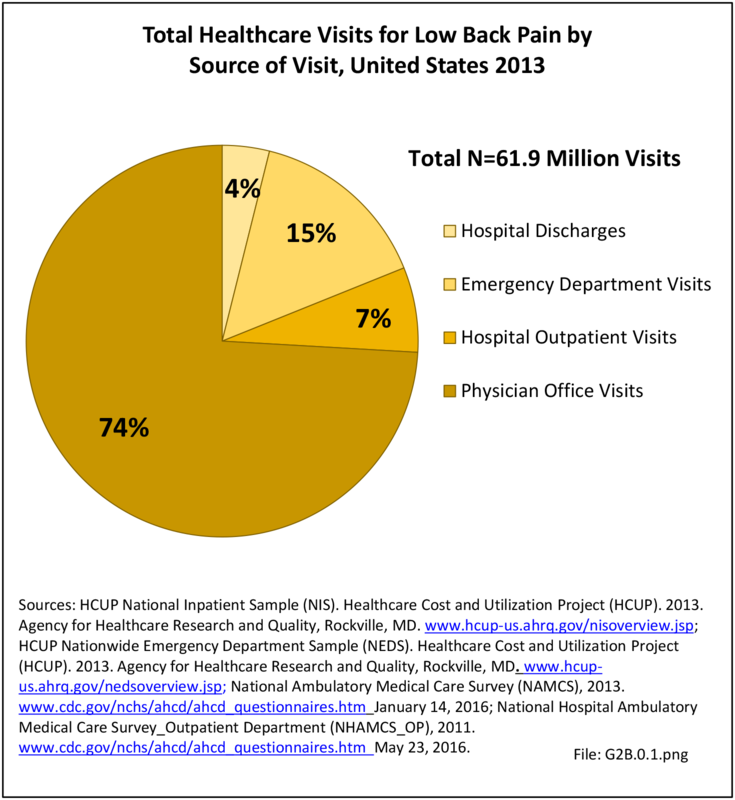 In the tables and graphs, total healthcare visits include hospital discharges obtained from the 2013 Healthcare Cost and Utilization Project (HCUP) National Inpatient Sample, emergency department visits obtained from the 2013 HCUP Nationwide Emergency Inpatient Sample, hospital outpatient visits obtained from the 2011 National Hospital Ambulatory Medical Care Survey Outpatients (NHAMCS-OP), and physician office visits obtained from the 2013 National Ambulatory Medical Care Survey (NAMCS). Back pain is a major health concern to older people. 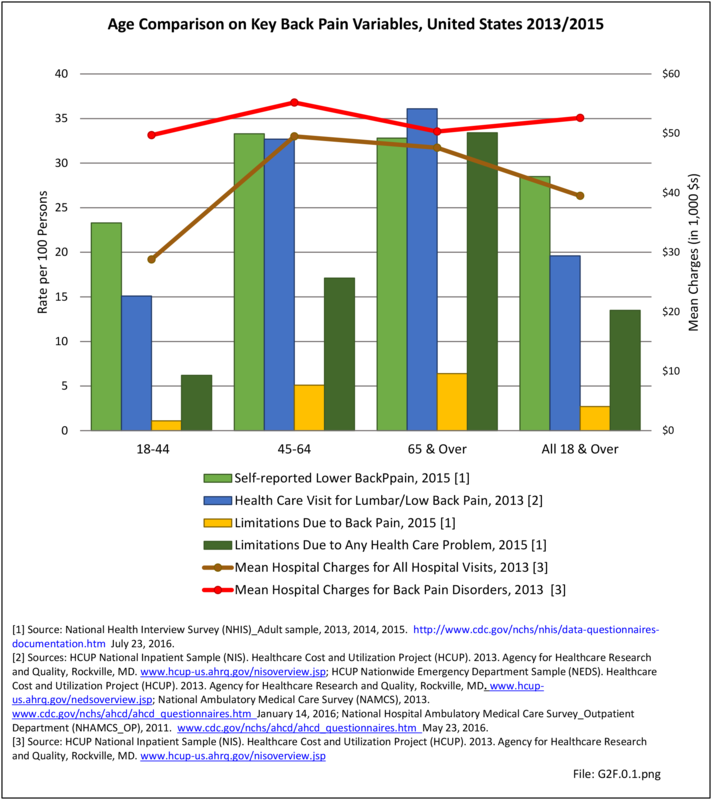 As the population ages, back pain becomes an increasing burden on the healthcare system. One of the greatest unmet needs related to back pain is the ability to clearly diagnose the source of back pain. 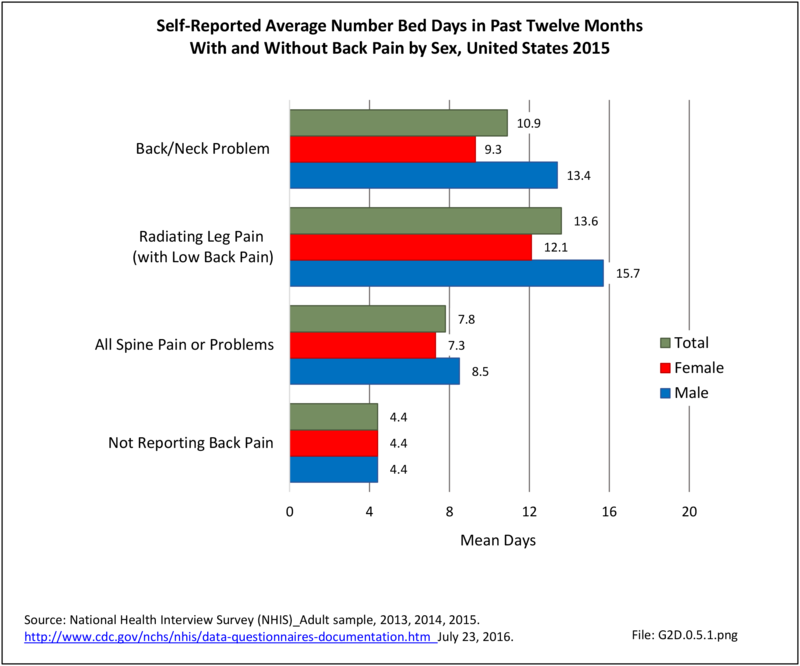 There are so many physical and non-physical sources of back pain that patients are often treated inappropriately before they are clearly diagnosed. 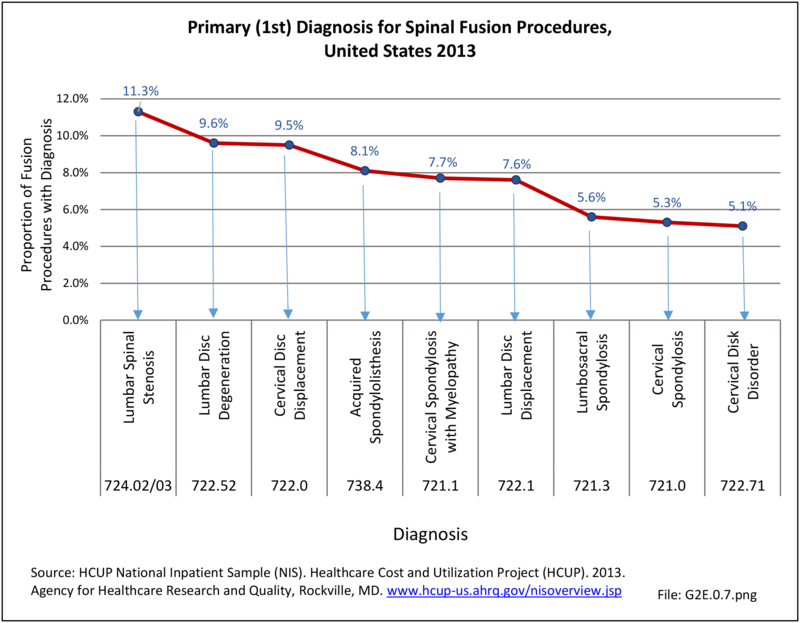 Thousands of dollars are often spent on diagnostic evaluations without finding a clear source of back pain, a process that needs to be broken by earlier diagnosis, earlier definitive treatment, and maintenance of the ability to continue working. 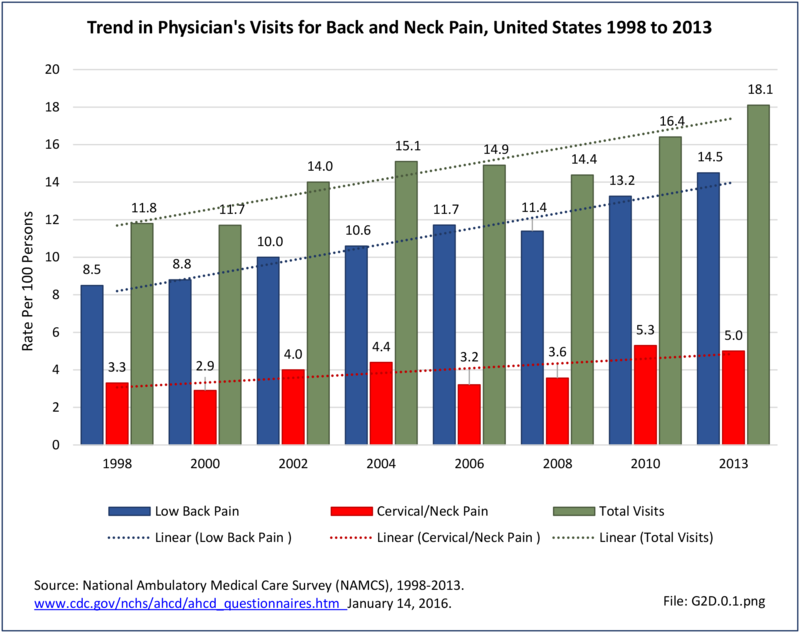 Most patients with back and neck pain are treated non-operatively, often with alternative treatments, including such treatments as acupuncture, homeopathy, and massage. 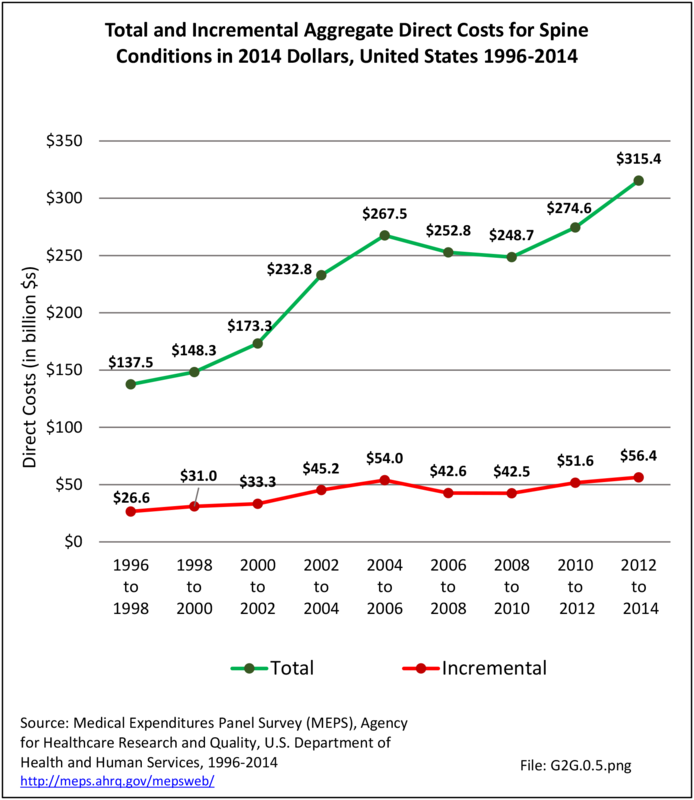 We know that enormous amounts of money are spent on many of these treatments, yet no quantifiable measures of cost or effect are yet available. 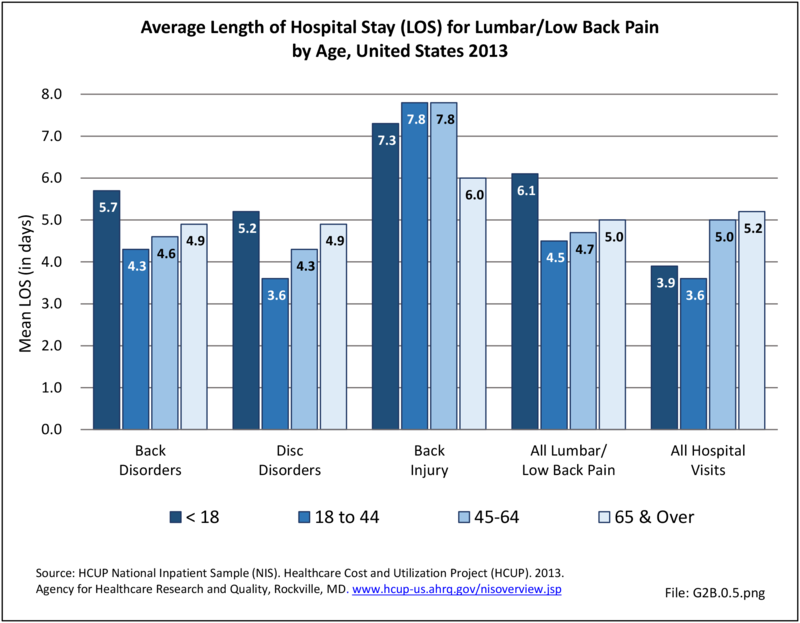 Furthermore, the lack of information about treatments by chiropractors, physical therapists, and other care providers results in underestimated cost estimates for treatment of low back pain. 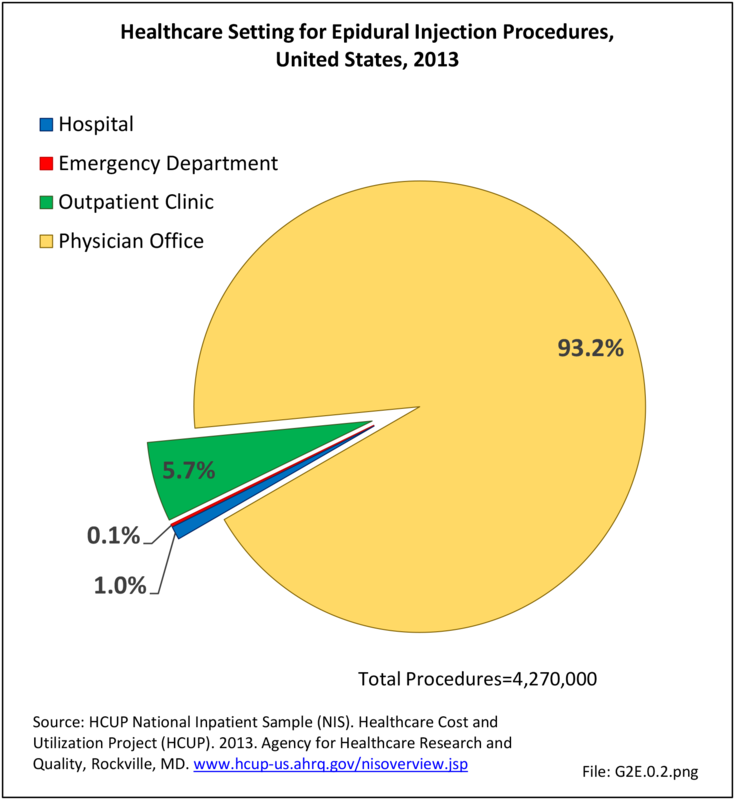 There is also a lack of information on medical procedures done in offices or surgicenters, limiting estimates of cost and effectiveness of many interventional procedures, including many surgical procedures. 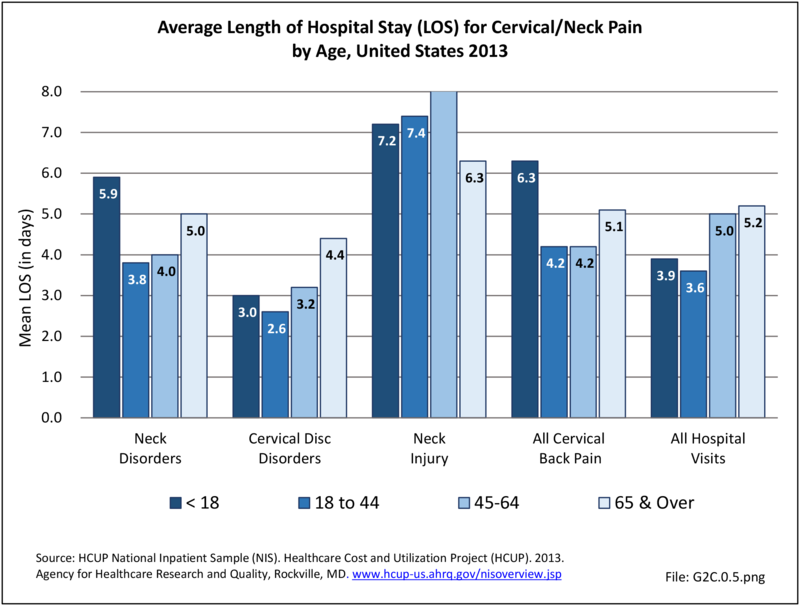 These gaps in knowledge should be filled to obtain accurate estimates of the impact of back and neck pain on society. 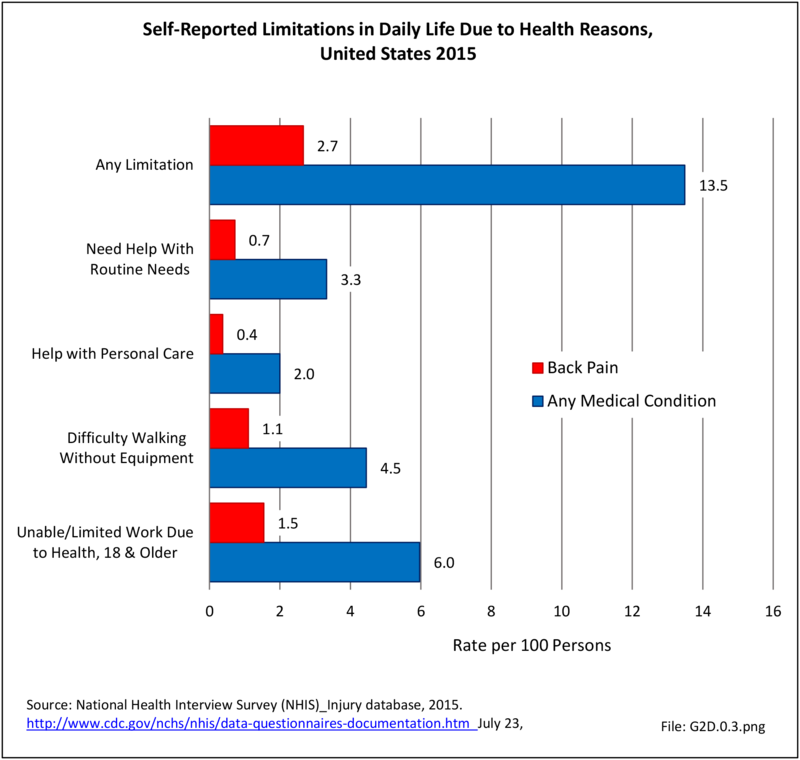 As such, there remains debate regarding the most effective treatment for low back pain. 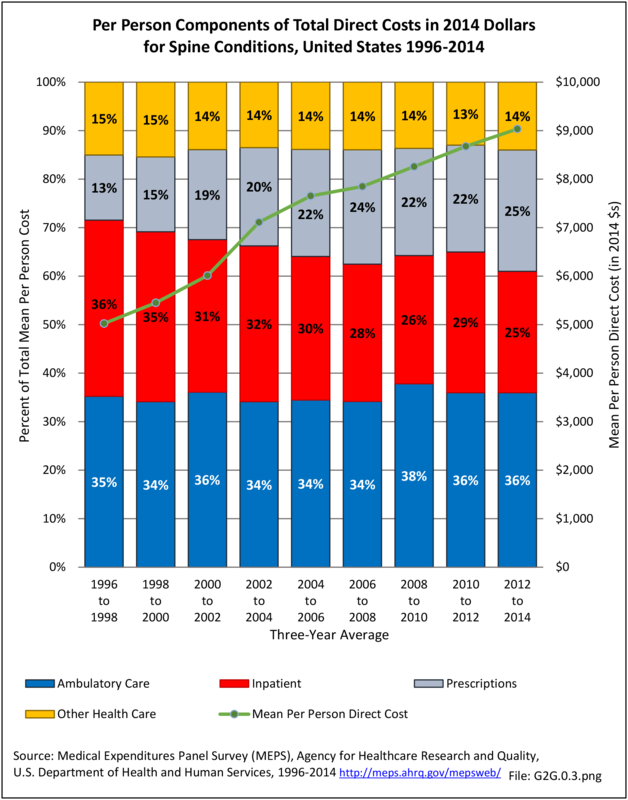 Increased recommended alternatives to non-surgical options adds credence for improved informed consent, creating conversation about benefits and risks and leading to a better shared decision making process for the patient. Though research is limited, per Zaina et al, informing the patient of anticipated outcomes of not only surgery but other options is vital. 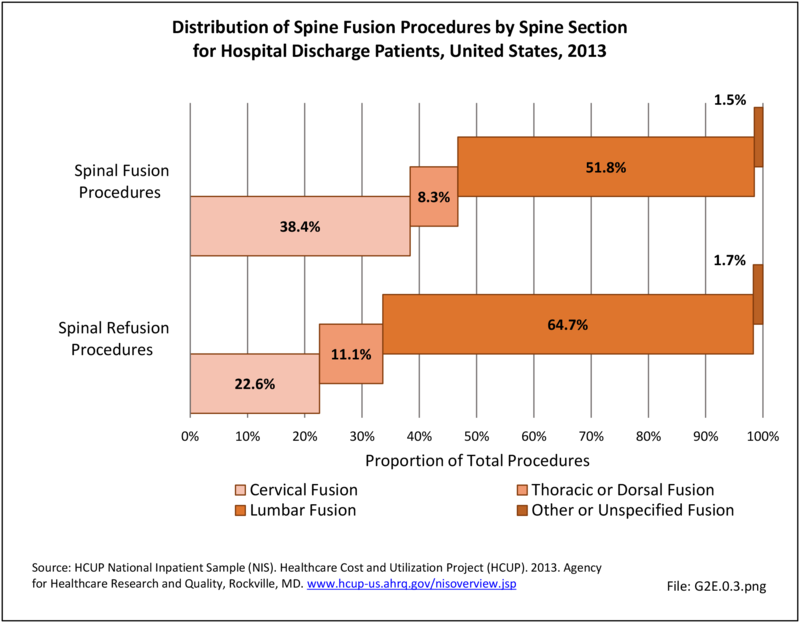 In a systematic review performed by Zaina et al, the authors evaluated the effectiveness of different types of surgery compared with different types of non-surgical intervention in the treatment of low back pain secondary to lumbar spinal stenosis (LSS).1 The authors’ analysis demonstrated no differences in pain-related disability improvement between surgical (decompression with or without fusion) and non-surgical care. However, due to the low quality of available studies, the authors were unable to confidently recommend a preferable treatment method for symptomatic LSS. 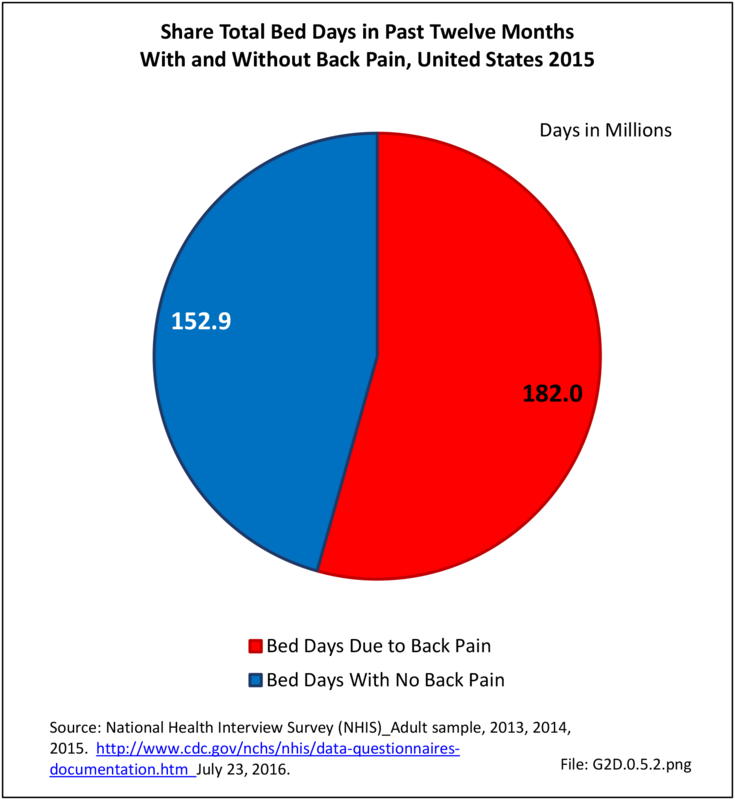 To begin addressing these needs, there has been an increase in research on the efficacy of non-surgical interventions for low back pain. Ammendolia et al investigated the safety and effectiveness of epidural injections to other treatments for symptomatic LSS.2 Due to the low overall evidence (only 4 randomized controlled trials), the authors were only able to conclude that epidural injections provide improved pain, function, and quality of life for only up to 2 weeks. Another area of increased interest is the effect of pre- and postoperative spinopelvic parameters (the relationship of the pelvic position to the spine) on treatment outcomes. Several previous investigations have described the magnitude of parameter correction afforded by surgical and non-surgical treatment modalities. However, many of these studies have featured small sample sizes and have rarely offered level I or II evidence. As such, there exists a need for large, prospective studies that investigate the true impact of influence of spinopelvic parameters on treatment outcomes for low back pain. Acupuncture has been utilized in the treatment of low back pain for centuries, and has recently been established as a non-operative complimentary treatment in the United States.3 A meta-analysis evaluating the use of acupuncture in the treatment of low back pain demonstrated the use of acupuncture as a complimentary, highly cost-effective treatment.4 According to the World Health Organization (WHO) cost-effectiveness threshold values, the cost of complimentary acupuncture treatment was determined to be $48,562 per disabilty-adjusted life year (DALY) avoided. Interestingly, in patients where comorbid depression was also alleviated at the same rate as pain, the cost was revealed to be $18,960 per DALY avoided. The authors concluded that acupuncture, as a substitute for standard care, was most cost-effective when used in patients with comorbid depression. 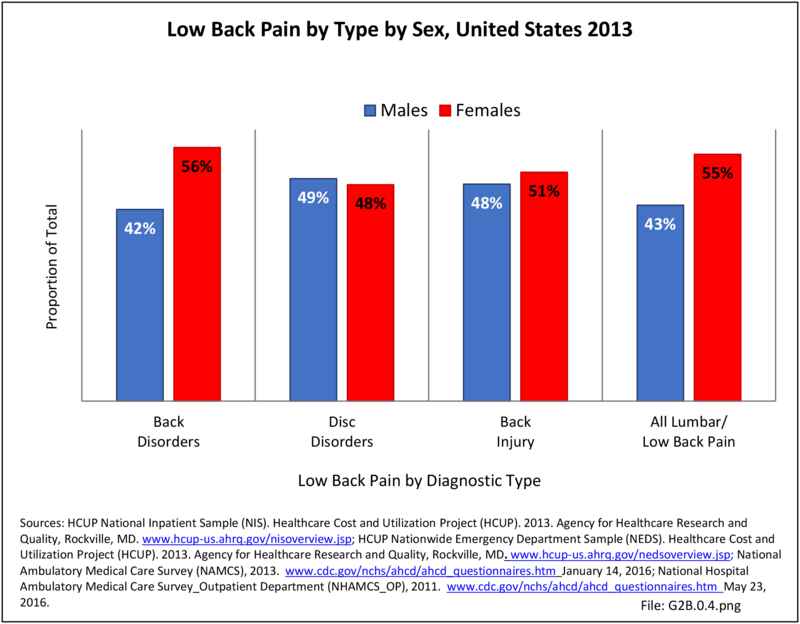 In general, there is a need for high quality clinical research in treatment of low back pain. This includes addressing the lack of evidence for best practices for non-surgical active care approaches and surgical treatment. 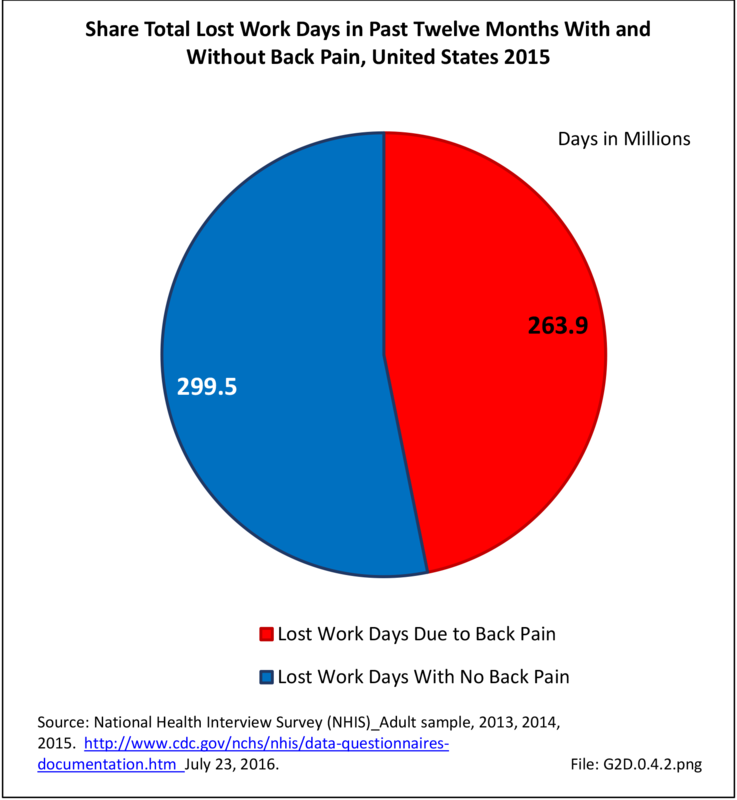 Additionally, work-related back pain has the potential to become "chronic" back pain, often with co-morbid dependence on narcotic pain medications. This process needs to be broken by earlier diagnosis, maintenance of ability to continue working, and earlier definitive treatment. 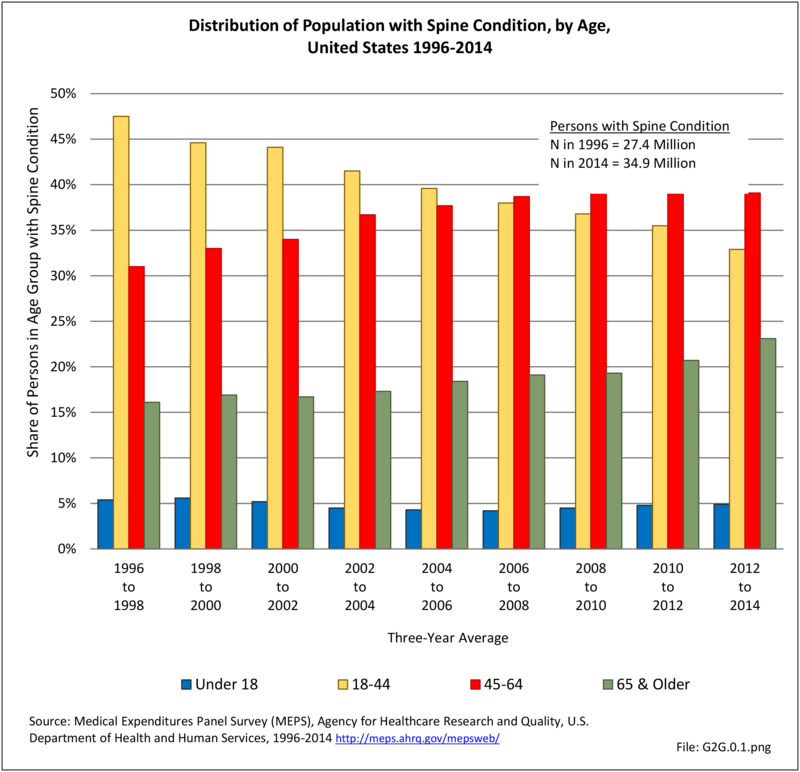 There is a need to promote a culture of "stopping back pain before it starts" by adopting spine care procedures, such as proper posture and balance exercise regimes, by persons of all ages as a counter to back pain. 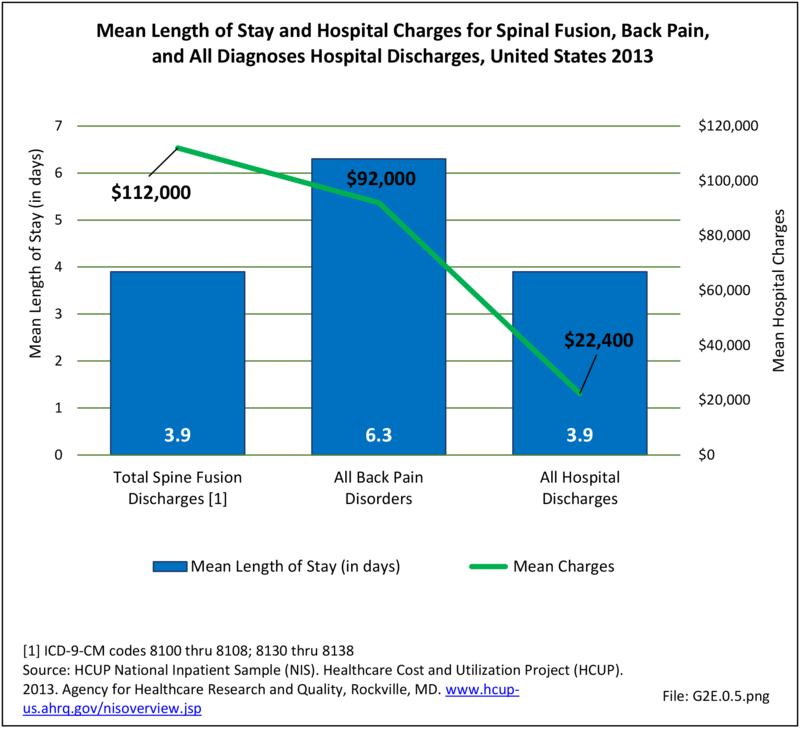 In addition to BMUS, the World Spine Care and Global Spine Care Initiative are coalitions all working to find ways to reduce back pain and back pain costs. 1. Zaina F, Tomkins-Lane C, Carragee E, Negrini S. Surgical versus non-surgical treatment for lumbar spinal stenosis. Cochrane Database Syst Rev. 2016(1):CD010264. 2. Ammendolia C, Stuber KJ, Rok E, et al. Nonoperative treatment for lumbar spinal stenosis with neurogenic claudication. Cochrane Database Syst Rev. 2013(8):CD010712. 3. Chao R, Qaseem A, Snow V, et al. 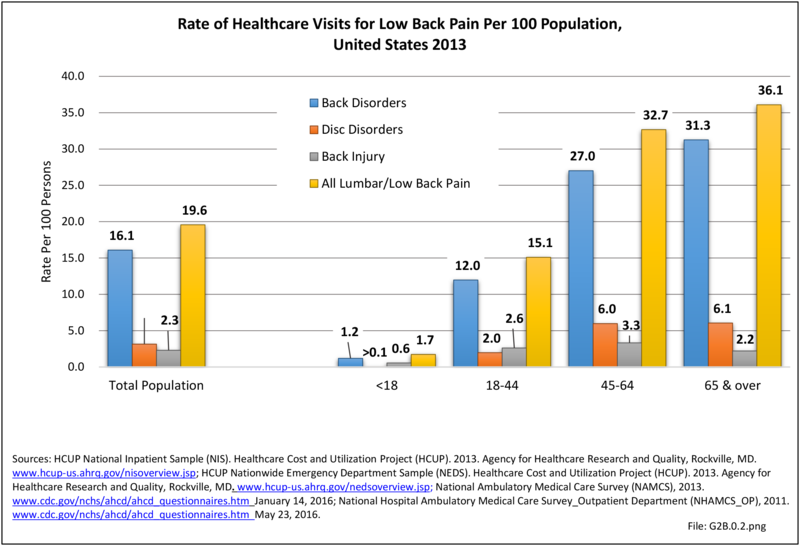 Diagnosis and treatment of low back pain: A joint clinical practice guideline from the American College of Physicians and the American Pain Society Ann Intern Med. 2007;147(7):478-491. 4. Taylor P, Pezzullo L, Grant SJ, Bensoussan A. 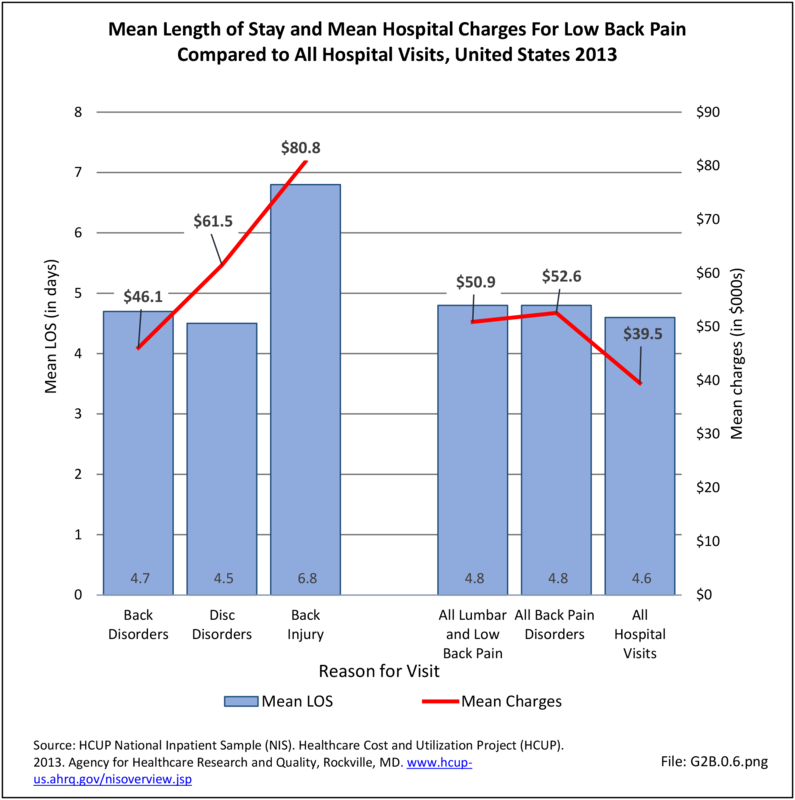 Cost-effectiveness of acupuncture for chronic nonspecific low back pain. Pain Pract. 2014;14(7):599-606. 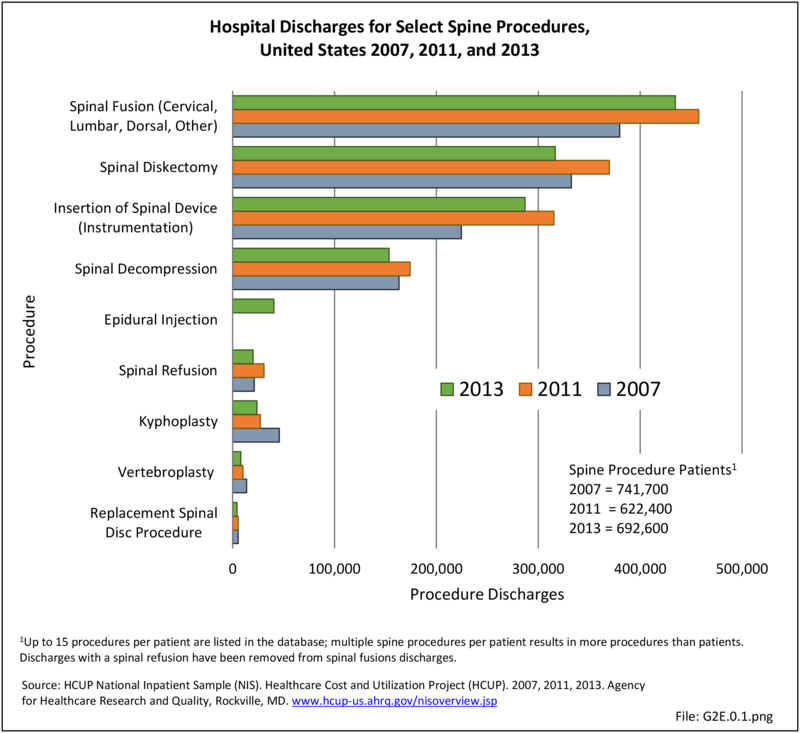 Conversion of the spine procedure codes was made and can be viewed by clicking HERE . 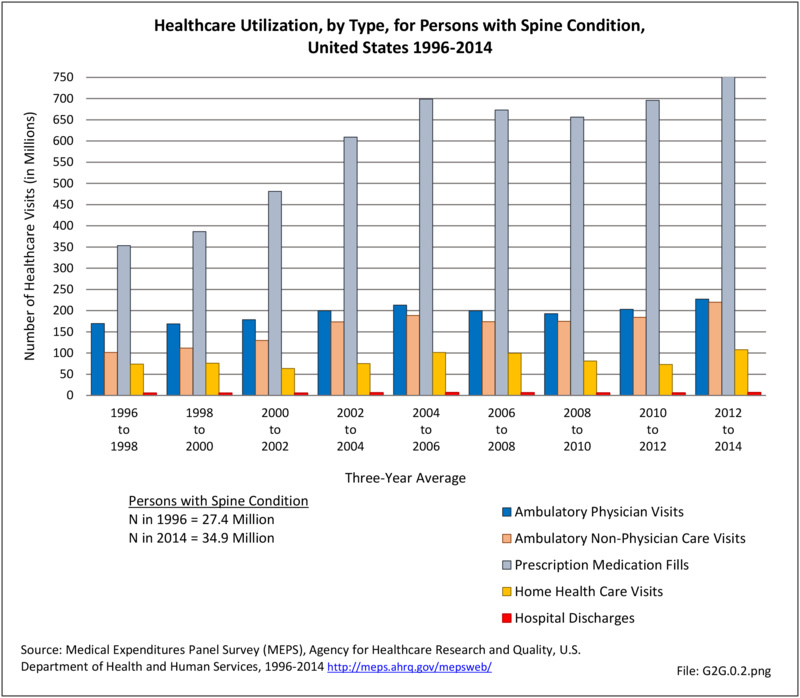 Again, the number of codes is greatly expanded, with more than 650 new codes representing the 25 spine procedure codes analyzed in this Fourth Edition of The Burden Of Musculoskeletal Diseases in the United States.